ERIE, Pa. (June 22, 2017) – Logistics Plus Inc., a leading worldwide provider of transportation, logistics and supply chain solutions, is proud to announce – for the second consecutive year – it has been selected by Supply & Demand Chain Executive, the executive’s user manual for successful supply and demand chain transformation, as a recipient of an “SDCE 100” Top Supply Chain Projects Award. 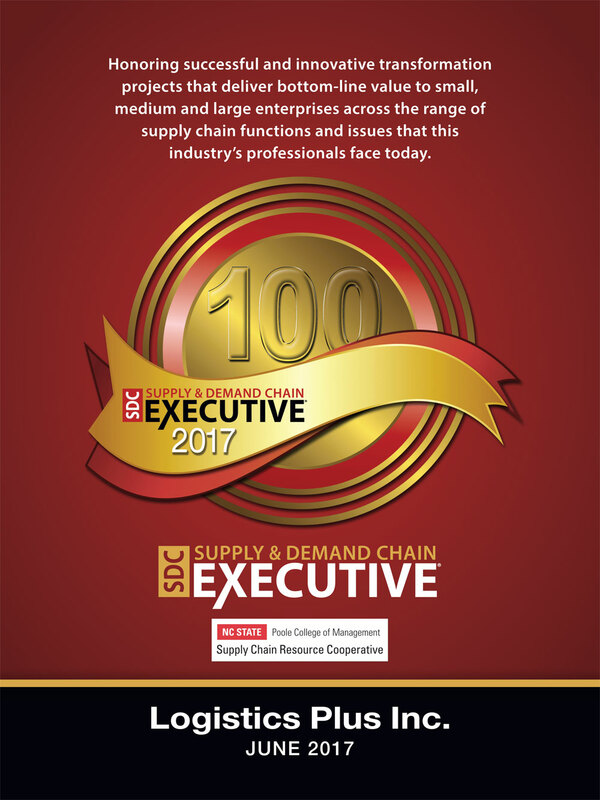 The SDCE 100 is an annual list of 100 great supply chain projects. These projects can serve as a map for supply chain executives who are looking for new opportunities to drive improvement in their own operations. These projects show how logistics providers help their customers and clients achieve supply chain excellence and prepare their supply chains for success. The supply chain project submitted by Logistics Plus that earned this year’s recognition involved the safe delivery of a 200-ton stator (the stationary portion of an electric generator) from Gdynia, Poland to a Yatagan Thermal Power Plant in Mugla, Turkey on behalf of a Fortune 500 power and energy company. Supply & Demand Chain Executive is the executive’s user manual for successful supply and demand chain transformation, utilizing hard-hitting analysis, viewpoints, and unbiased case studies to steer executives and supply management professionals through the complicated, yet critical, world of supply and demand chain enablement to gain competitive advantage. Visit them on the web at www.SDCExec.com. Logistics Plus Inc. provides freight transportation, warehousing, global logistics, and supply chain management solutions through a worldwide network of talented and caring professionals. Founded in Erie, PA by local entrepreneur, Jim Berlin, 20 years ago, Logistics Plus is a fast-growing and award-winning transportation and logistics company. With a strong passion for excellence, its 400+ employees put the “Plus” in logistics by doing the big things properly, and the countless little things, that together ensure complete customer satisfaction and success. The Logistics Plus® network includes offices located in Erie, PA; Alma, AR; Little Rock, AR; Los Angeles, CA; Riverside, CA; San Francisco, CA; Visalia, CA; Atlanta, GA; Chicago, IL; Detroit, MI; Kansas City, MO; Charlotte, NC; Lexington, NC; Buffalo, NY; Cleveland, OH; Charleston, SC; Greenville, SC; Nashville, TN; Dallas, TX; Fort Worth, TX; Houston, TX; Laredo, TX; Madison, WI; Australia; Bahrain; Belgium; Canada; Chile; China; Colombia; Egypt; France; Germany; Hong Kong; India; Indonesia; Kazakhstan; Kenya; Libya; Mexico; Poland; Saudi Arabia; Singapore; South Sudan; Taiwan; Turkey; UAE; and Uganda; with additional agents around the world. For more information, visit www.logisticsplus.net or follow @LogisticsPlus on Twitter.